The April 12, 1861, Confederate attack on Fort Sumter marked the beginning of the Civil War and left the populations of border states such as Missouri pondering where their loyalties lay. In the months immediately prior to the war's outbreak, the leaders of Kansas City (then called the Town of Kansas), had preferred to stay neutral and focus on the local economy instead. But when a band of residents raised a Confederate flag on April 30, 1861, it appeared that Kansas City, and perhaps even the state of Missouri, would tilt toward the Southern, secessionist side. The situation was indeed dicey. A majority of Kansas City's population, which had barely reached 4,000 by 1860, was made up of former Southerners, and pro-secessionist forces were on the advance. An informal band of Confederate sympathizers went out and captured munitions at the Union arsenal in Liberty, Missouri, just days after the battle at Fort Sumter. And Mayor Robert T. Van Horn, a Kansas City newspaperman and avowed Unionist, had managed to win a close election against a pro-secessionist candidate only by adopting a "moderate" platform that supported pro-slavery views and loyalty to the Union simultaneously. The Missouri Constitutional Convention, undertaken two months prior, had determined that Missouri would not secede from the Union. Its delegates declared the state's official position to be "neutral." Missouri's Governor Claiborne Jackson, on the other hand, supported the secessionists. 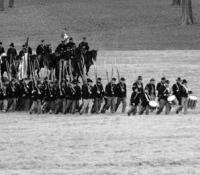 In May, Governor Jackson ordered the state militia to attack a Union arsenal in St. Louis. From April until June, Missouri effectively had two state governments, with the pro-Confederate faction in control of the state capital at Jefferson City. In April 1861 this pro-Southern regime denounced Van Horn's authority as mayor on account of his pro-Union declarations. Kansas City's tentative pro-Union stance came under further attack on April 30, when Kansas City residents in favor of secession raised a Confederate flag at present-day Second and Main streets. It appeared that Kansas City might be on the verge of falling to the rebels. Notwithstanding Jefferson City's orders to resign as major, Van Horn sought and received a commission at the rank of "major" from the Union Army and remained the mayor of Kansas City. The raising of the Confederate flag within the city's limits marked a final point of decision for Kansas City. Van Horn denounced this visible sign of Confederate influence in the city and requested Union reinforcements from Fort Leavenworth. On June 14, five companies of U.S. troops finally entered the city to secure it for the Union. They constructed the "Camp Union" stockade to house the cavalry on the foundation of the uncompleted Coates House Hotel. The Union soldiers quelled dissent among Confederate sympathizers throughout the city. At about the same time, other Union forces captured Jefferson City and established a new pro-Union state government with the unelected provisional governor Hamilton Gamble. To provide further protection, Van Horn organized a local defense unit, called the "Home Guard," which assisted the Union soldiers in maintaining order in Kansas City. By the end of June, Kansas City and the State of Missouri were back in the hands of the Union, but neither would be truly secure until the latter parts of the war. Most notably, Confederate General Sterling Price, a former Missouri governor, led several incursions into the state. The first of these advances resulted in a Confederate victory on September 1861 at Lexington, Missouri, just 50 miles northeast of Kansas City. More famously, in October 1864, General Price lost the largest battle ever fought in the West at the "Battle of Westport," which took place within the boundaries of present-day Kansas City, Missouri. Although the Confederates lost that battle, defeat came only after Price's army had threatened to take St. Louis and then fought its way westward across the entire state. Confederate raiders would remain a threat to Kansas City and its environs throughout the war. Secessionist guerillas continued to suppress trade into and out of the city, and they ravaged much of the surrounding farmland. The young city remained in the Union throughout the Civil War due in large part to the efforts of Robert Van Horn. Read full biographical sketches of Kansas City leaders during the Civil War, prepared for the Missouri Valley Special Collections, The Kansas City Public Library. 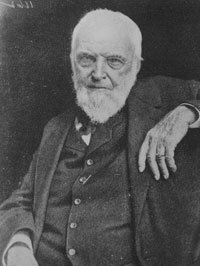 Biography of Robert Van Horn (1824-1916), newspaperman and civic leader, by Barbara Magerl. Biography of Kersey Coates (1923-1887), civic leader and colonel in the Missouri Militia, by Barbara Magerl; Coates, an uncompromising abolitionist, organized the defense of Kansas City against pro-Confederate guerrilla soldiers. Biography of Johnston Lykins (1800-1876), missionary, doctor and Kansas City's second mayor, by Daniel Coleman; Lykin's wife was forced out of Kansas City due to her outspoken support of secession. Biography of William S. Gregory (1825-1877), first mayor of Kansas City, by Susan Jezak Ford; Gregory, a Southern sympathizer, left Kansas City for the duration of the war. Biography of Theodore S. Case (1832-1900), soldier, scientist, and physician, by Daniel Coleman; Case was quartermaster for Van Horn's 13th Missouri Volunteers, which led campaigns outside of the Kansas City area later in the war. Biography of Milton J. Payne (1829-1900), Kansas City mayor, by Daniel Coleman; Payne served in the Missouri House of Representatives and supported the Union during the Civil War. View images from the Missouri Valley Special Collections that relate to Robert T. Van Horn and the Home Guard. Early Kansas City Mayors, portraits, 1853-1886. Postcard of the Coates House Hotel. Construction halted during the war, and Camp Union was built on the building's foundation. A brief history of the hotel is included. Coates House Hotel; another postcard of the hotel with a historical sketch. Broadway Boulevard in 1870; photograph taken near the Coates House Hotel. Robert T. Van Horn, seated portrait. Robert T. Van Horn, portrait view. Robert T. Van Horn, head and shoulders portrait, hand-drawn. Partial frontal view of Robert Van Horn. Blue River, Near 15th Street, postcard; shows a crossing at the Blue River where family members and friends met the returning Home Guard soldiers who survived a defeat at Lexington, Missouri, in September 1861. Check out the following books and articles about Robert T. Van Horn and the Civil War near Kansas City. "About the West: Kansas Abolitionists Fight Confederates in Missouri," by D. Reid Ross in the Journal of the West. "The Civil War Letters of Colonel Bazel F. Lazear," by Vivian McLarty in the Missouri Historical Review; Lazear was a member of Kansas City's Home Guard. "Robert Thompson Van Horn and the Growth of One Frontier," by A. Theodore Brown, in Trail Guide magazine; includes an account of "Van Horn's battalion". K.C. : A History of Kansas City, Missouri, by A. Theodore Brown and Lyle W. Dorsett. The first chapter contains extensive information about the Civil War and Kansas City, pp. 1-36. Turbulent Partnership: Missouri and the Union, 1861-1865, by William Earl Parrish. Continue researching Robert T. Van Horn and the Civil War near Kansas City using archival material held by the Missouri Valley Special Collections. Vertical File: Fort Union; also known as "Camp Union"
Continue researching Civil War battles in Missouri, Kansas, and Arkansas using archival material held by the Missouri Valley Special Collections. Brown, A. Theodore and Lyle W. Dorsett. K.C. : A History of Kansas City, Missouri. Boulder, CO: Pruett Pub. Co., 1978. Haskell, Henry C. and Richard B. Fowler. City of the Future: A Narrative History of Kansas City, 1850-1950. Kansas City, MO: F. Glenn, 1950. Vertical File: Kansas City - Chronology. Missouri Valley Special Collections, The Kansas City Public Library.